Yamato Scientific has been working to deepen relations with Waseda University and its professors over many years. This time, it has delighted us to make a donation in support of the construction of the Nakano International Community Plaza, a new facility of which we highly value the idea behind it. 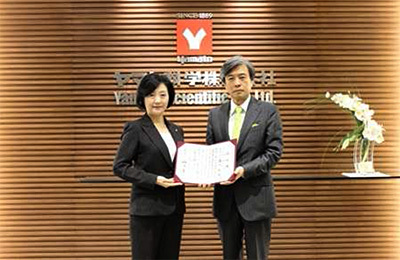 In appreciation for this donation, Waseda University has planned to display a Yamato Scientific name plaque at the entrance hall of the Nakano International Community Plaza and entrance to the Waseda International Student House. Waseda University's Nakano International Community Plaza opened this year, and consists of a lifelong learning facility on the first floor, while the second floor up to the eleventh floor serve as a student house providing multipurpose classrooms as well. This makes it a facility highly suitable for international co-education and in the meantime it functions as a place to bring together the local community.